JUST 1 MONTH TO SAVE HUMANITY !!! 1 month… that’s all that’s left to prevent humanity’s self-destruction. Maitreya Rael announced this urgent warning on April 9. He is urging the whole world to “meditate 1 minute for peace” to support an upcoming United Nations vote on a resolution that would forbid nuclear weapons worldwide. The vote is scheduled for July 2017. Do you want a future for you and your children? Please act immediately by urging your government to participate in this vote and support the international ban of nuclear weapons. 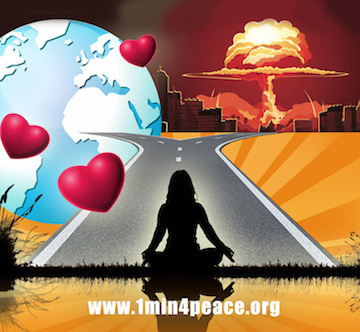 All politicians and governments will share responsibility if the nuclear catastrophe occurs. But all who are not active in forcing their governments to participate in this crucial vote are also responsible. This is our last chance to save humanity.